Indiana Jones and the Temple of Doom was released in 1985 and is based on the movie of the same name which was released prior to the game. Indiana Jones can bedescribed as a "platform style" game with each level consisting of three different scenes. In the first scene you control Indy and you must rescue all of the captives while avoiding Thugee guards, bats, spikes, and falling off of cliffs. Once you rescue all of the captives, you then proceed to the mine entrance and start scene two. In the second scene, you control a runaway mine cart driven by Indy and try to avoid breaks in the tracks, other carts, bats,and dead ends. In the third scene, you must retrieve the stone while avoiding Mola Ram and the Thugee guards. 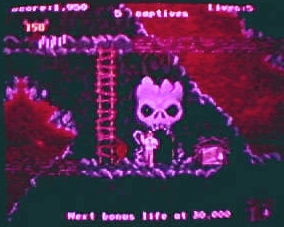 There is also another stage at the end of the game known as the bonus round in which you collect idols for extra points. This stage does not end and goes on until all of your lives are lost.